On March 21st, 2010 nothing happened. You remember my post from half year ago, when I announced that we'd have to be open by today. If you drove by our place today - as many people did, and many asked the usual question when we'd be open - you'd see us buzzing around as always. So what's going on? Well, we learned a little while back that we don't actually have to be open today (or more precisely before the end of the month), but we need to provide various documents, among them the certificate of occupancy (which we just received), proof of workers compensation insurance, and pictures of the place showing it in openable condition. That's what all the pictures were about recently. 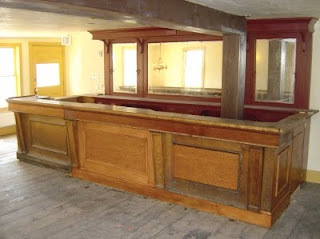 And here are some more, showing the bar (in openable condition). Gunk Haus is pretty close to being done. There is still a little bit of detail work to be finished, but we're close. And then there is still the health department, which wants to be pleased (this isn't a problem either, it's just work that needs to be done). So, when are we going to be open. The optimistic answer is the end of April, but it shouldn't be later than May. You've seen the pictures, we're almost ready, the only reason why we would delay is fear. Yes, you read right. The last two years were hard, but I have gotten used to it, and even in misery people can feel comfortable, because it is what they know. Now we are putting all that aside and start something new. Suddenly we have to make Gunk Haus work. Did we create the right atmosphere? Will people accept it? Will customers like the food? There is a lot of anxiety going on, so be kind when you first visit Gunk Haus. Yes yes and yes. The bar looks amazing - great job! OMG it looks amazing. Can I make my reservation now? We'll have whatever you're serving. Just as long as I can sit at that gorgeous bar. Wow! Soon, soon! Ann, I have bad news for you: We won't have any bar stools at the bar. 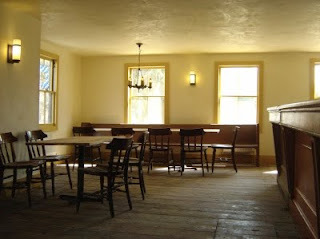 Originally that was a financial decision, but the longer we thought about it, the more we liked the idea of not having bar stools, because it de-bar-ifies the bar, and it improves traffic flow through the bar.